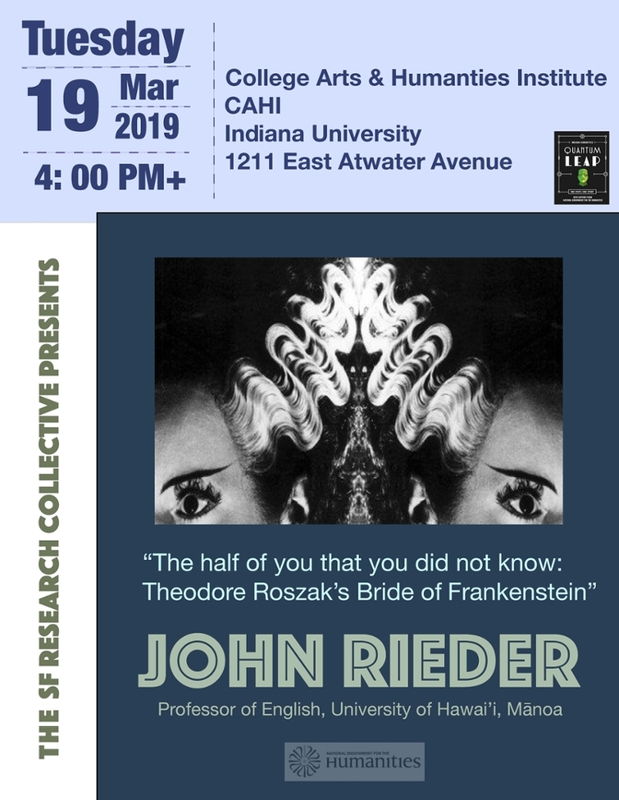 John Rieder: "'The half of you that you did not know': Theodore Roszak's Bride of Frankenstein"
The Science Fiction Research Collective invites you to the first in our two-part Spring semester Year of Frankenstein events. We are excited to host John Rieder, Professor of English at the University of Hawai'i. Dr. Rieder is the author of several works on science fiction including Colonialism and the Emergence of Science Fiction (2008) and, most recently, Science Fiction and the Mass Cultural Genre System (2017). His talk, "'The half of you that you did not know': Theodore Roszak's Bride of Frankenstein," is supported by a grant from the National Endowment for the Humanities. What: "'The half of you that you did not know': Theodore Roszak's Bride of Frankenstein,"
Sponsored by the Science Fiction Research Collective and the National Endowment for the Humanities.